Time has rolled round yet again, the year has been reset and by the time you read this most people's New Year’s resolutions will have been broken. Hopefully your New Year’s resolution wasn't to buy less table top games, because there are loads of awesome board, card, miniature and roleplaying games set to be released in 2017. Every year this list gets easier and easier to write as game publishers provide more and more information early and start promoting their games. In fact I've really struggled to keep this list down to X games. It also means that games can be delayed. All the games listed here are slated to be released in 2017, but as we've seen in previous years there may be some delays. Let's kick things off with a bit of trippy mind-screwing. Superhot is a first person shooter video game where time only moves when you move. Think about that for a moment... yes its proper mental. (By the way you can play a free version of the game here.) 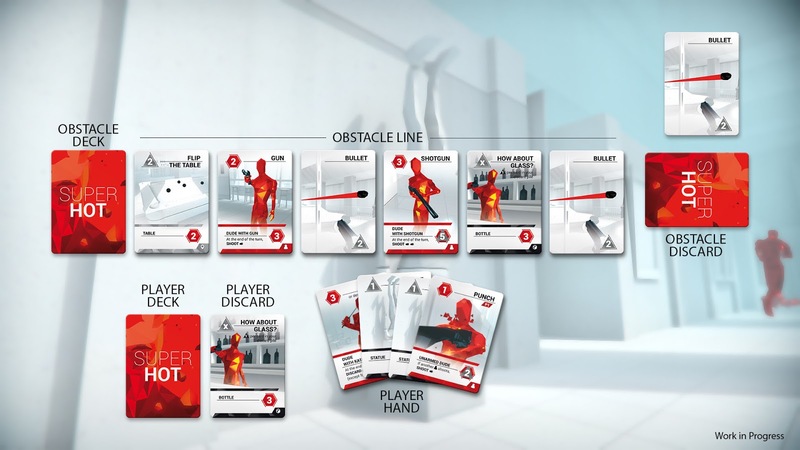 Our Polish friends over at Board & Dice are attempting to bring this four dimensional headache to our table tops in Superhot The Card Game and it will be hitting Kickstarter very soon. Board and dice have already shown that they have replicated the distinctive artwork and graphical style of the video game but I'm really keen to see if they can master the blend of first person shooter and puzzle game that the digital version masters so well. If you're a competitive card game player there is one game for you this year, and mark my words it's going to be a huge: Legend of the Five Rings: The Card Game. Fantasy Flight Games are continuing their annual Living Card Game release schedule with a new version of the classic collectible card game. Legend of the Five Rings, or L5R as it more commonly abbreviated to, was a competitive CCG with a huge cult following. Based on eastern myths and legends it was jock full of ninjas, samurai, swords and assassinations. Decks are built around a number of clans each with their own distinctive play style. 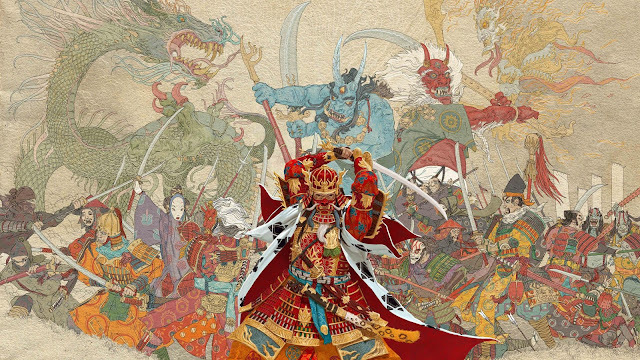 What makes L5R unique in my opinion was that tournaments were used to progress the story, with the narrative structure of the game based upon which clans performed the best. The community was intertwined with the game itself with tournament winners appearing on cards. 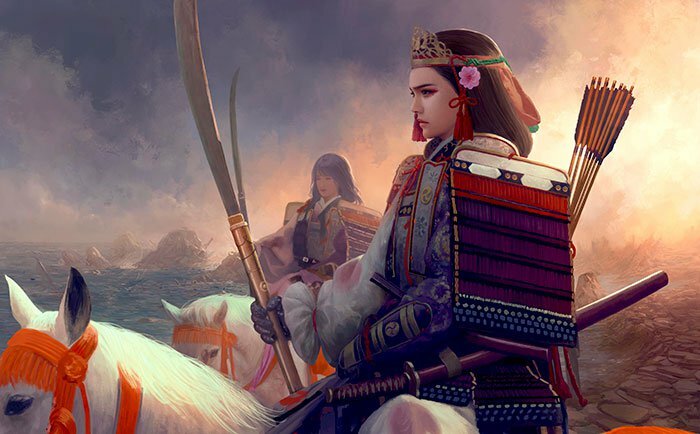 L5R has a huge cult following and with Fantasy Flight Games behind this latest version I can see it being a huge success. Sticking with a Fantasy Flight Games, the table top miniatures game that has most caught my attention is the new Runewars Miniature Game. 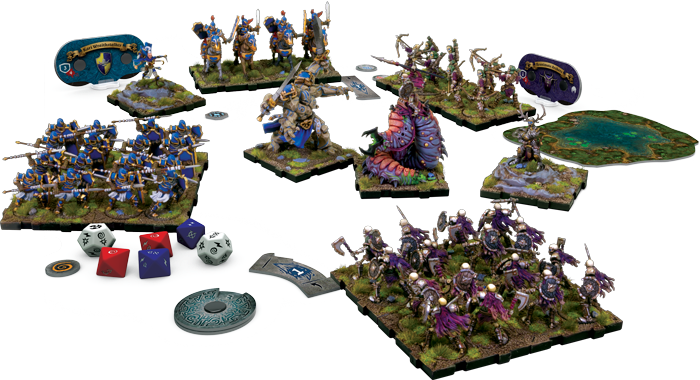 Looking like a modernised Warhammer fantasy battles but with mechanics derived from X-wing and Armada, Runewars is going to be Fantasy Flight’s next big attack on the tabletop miniature market. Fantasy Flight Games have had a mixed history with miniatures games; you can't deny the success of X-wing but Dust Warfare didn't go according to plan. However, it looks like Fantasy Flight Games have developed this game completely in-house, so expect the usual level of tournament support and wave releases. 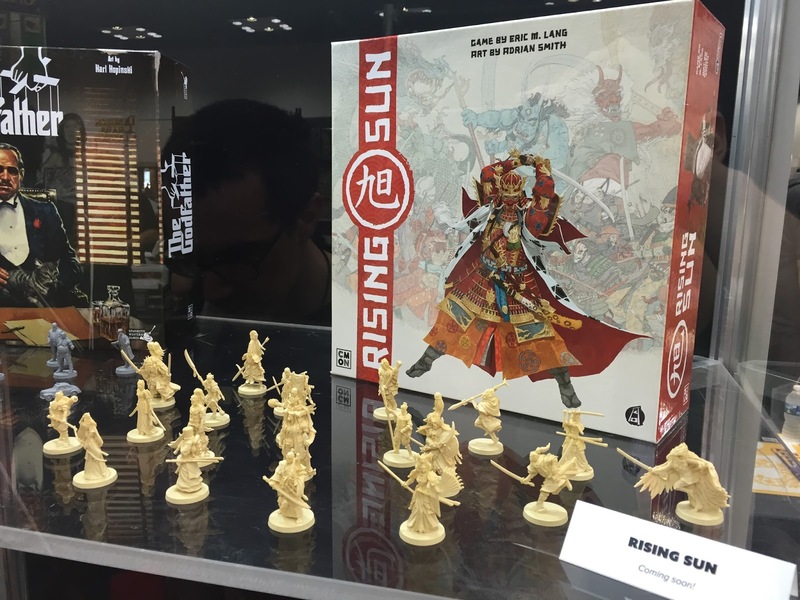 The hype for CMON’s Blood Rage was huge, and the band are reforming as games designer Eric Lang, artist Adrian Smith and CMON’s production team are working together again on Rising Sun. What little information we have about game so far is that it will be a sequel of sorts to Blood Rage but instead of Vikings the action will be taken to Feudal Japan. Whereas Blood Rage was about area control and careful use of the Gods’ gifts, the understanding is that Rising Sun will be based around diplomacy and negotiation. Eric Lang has teased details about kidnapping, seppuku and an honour track. Based on the success of Blood Rage, this Kickstarter is going to be huge. Top of my list of most anticipated games is Dark Souls The Board Game. Dark Souls is replicating the dark, depressing and downright difficult world of From Software’s video game series into the cardboard realm. We've already played a demo of one of the boss fights and I was so impressed I backed the entire Kickstarter (my largest Kickstarter investment to date). Dark Souls is going to be a hard sell to those who don’t know its history. From the brief slice I have seen it was evident that the board game had managed to transcribe the balance of battle tactics and difficulty which means many players are going to struggle with just how hard this cooperative board game will be. 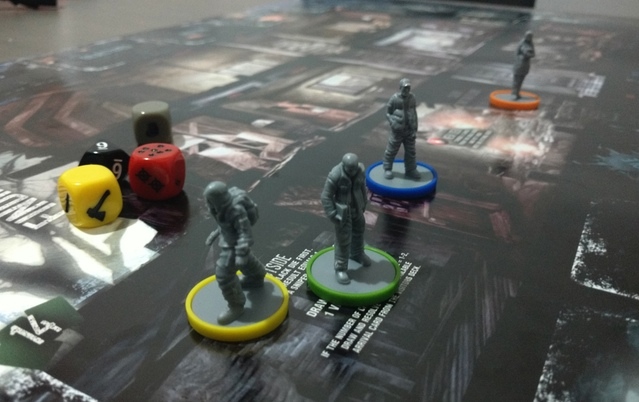 Sticking with the depressing and horribly difficult video game to board game conversions, This War of Mine should be heading to production and into our cold hands this year. Based on real events from the Siege of Sarajevo, This War of Mine puts you in charge of a house of survivors desperately trying to stay warm and fed in a city torn apart by war. The video game is one of the most bleak games I have ever played, more so because it is based on first-hand accounts of the people that survived. Going on a raid to get food and medicine has just as much chance of getting you shot by opposing looters as it has for you to realise you are stealing from a house of starving old people and so a grim morale decision has to be made. Hopefully the board game can do this dark and depressingly real experience justice. For some reason I have been reading a lot of novels about thieves lately, namely Scot Lynch's Gentleman Bastards series and Brandon Sanderson's Mistborn trilogy, both of which are particularly relevant. Perfect Crime is a semi cooperative game where you must work against the bank player to perform heists into high security financial institutions, attempting to get out with cash and precious gems. Based in our modern world, Perfect Crime takes its influences from Heat and the heists of GTAV as you tool up, hack security and bribe guards. Perfect Crime is neatly split into two gaming sections. The planning phase involves loaning cash, buying equipment and generally planning how you will approach your heist. But players have to be careful, as the longer the criminals spend in planning the more opportunity the bank has to increase security and attempt to anticipate the thieves’ plans. The game then switches to a tactical board game where players have to get there thief pieces in and out of the bank without tipping off security. The more the criminal players alert security the more actions the bank player can make as he attempts to thwart the other players’ plans. I played an early prototype of Perfect Crime at the UK games Expo and it was a lot of fun and so I’m really looking forward to the game’s release. Another Kickstarter that I have both played and backed is No Honor Among Thieves, taking direct influence from the Lies of Locke Lamora, No Honor Among Thieves sounds on paper a lot like Perfect Crime but that couldn't be further from the truth. Set in a fantasy city you will either work with or against rival thieving crews as you attempt heists on targets rich with stout guards, deadly traps and ingenious locks, oh and suddenly cultists. At its heart No Honor Among Thieves is a take that game as you play cards from your hand to either help or hinder the current heist. The game is full of wheeling and dealing but the true coup de grace is the betrayal system. You can attempt heists with your fellow players, providing the heist was successful, you can betray your ally at the last minute running off with all the loot. What's really clever is the game changes once a betrayed has occurred activating more devious and more bloody skills and actions. Once a single player betrays another the game becomes much more cut throat and the tension this creates is palpable. Most tenuously, is Mistborn House War, being directly based upon Brandon Sanderson's first book in the Mistborn trilogy. Instead of being based upon the thieving crews of the novel, it is instead based around the various noble houses of Elendril, all trying to gain favour with the High ruler. Of course you want your family to come out on top so you need to make sure that so best to ruin to the other houses while ensuring the city is safe and the Survivor's uprising doesn't destabilise the city. However, if the Lord Ruler should fall then it is the house that distanced itself from the Lord Ruler’s dictatorship that will win. 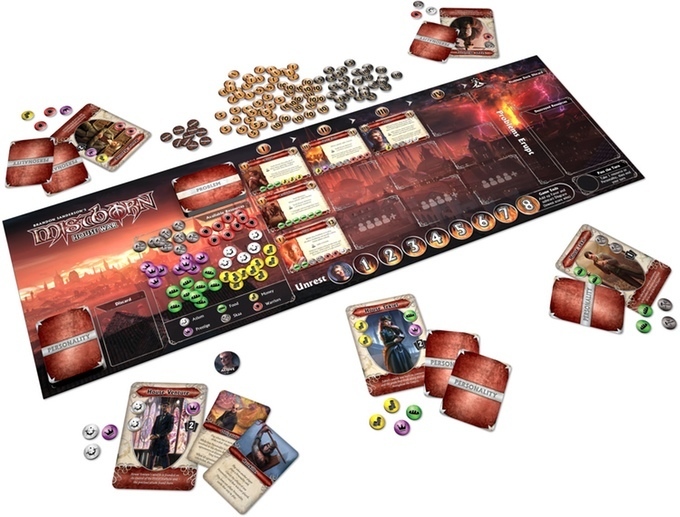 Mechanically Mistborn house war, sounds very similar to both Crisis and New Angeles, a semi cooperative game where you must work together to prevent the world from collapse while at the same time come out on top of your opponents. I consider myself a bit of a fan of Kevin Wilson's game design; Darkness Come Rattling is an underappreciated gem of a game so I'm hoping his sold experience in cooperative game design makes Mistborn another great game. Unfortunately I didn't back this on Kickstarter due to the high shipping cost to the UK so I will be waiting impatiently for this to hit retail. While we're talking semi cooperatives I think we should mention Everdark. Due to hit Kickstarter sometime in early 2017, Everdark also has you working together to fend off the darkness but secretly wanting to screw your opponents and becoming king of the hill. 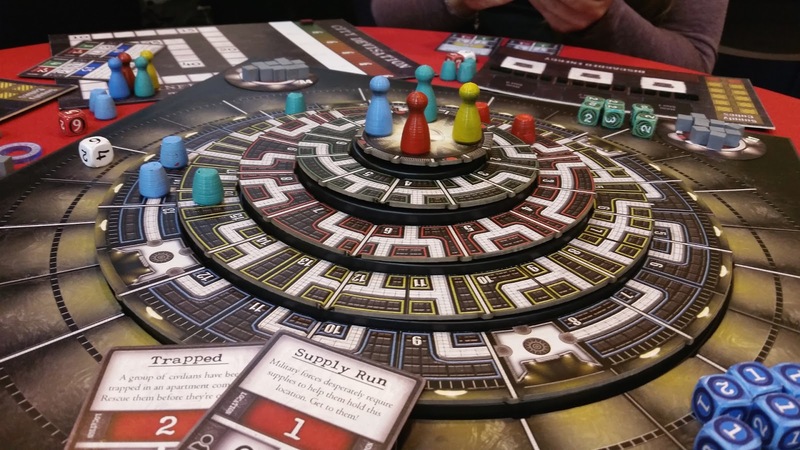 Everdark is based around a rotating board, representing the winding street of the city of Phos. You’ll need to keep your avatar navigating the streets of Phos safely so it’s important to use its movement wisely and reconfigure the city’s rotating sections to make your move more efficient. That you left your opponent stranded was merely a coincidence surely. So there you have 10 games to whet your appetite for gaming in 2017, but there’s a lot more and we’ll be back soon with another 10 games to tell you about. Don't forget to check out Part 2 of our 20 Awesome looking Board Games Coming in 2017.